The prosecutor said the four protesters "made the choice to engage in violence and destruction," and she promised jurors they would see video of three of the defendants destroying property. Editor’s Note: This story has been updated to correct the number of charges dropped, the number of remaining defendants and property allegedly destroyed by protesters. 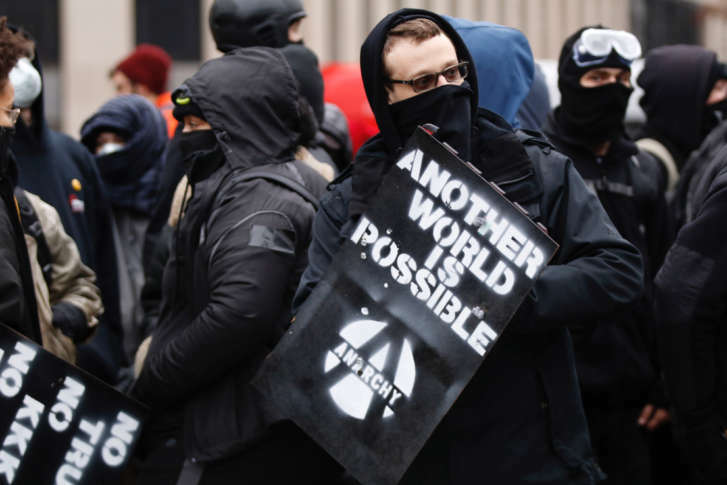 WASHINGTON — Five months after a D.C. jury acquitted six protesters charged with rioting on the day President Donald Trump was sworn into office, prosecutors’ opening statements in a second trial presented a new theme. The four protesters now on trial played active roles in the destruction and were not simply bystanders in black, argued U.S. Attorney for the District of Columbia Jennifer Kerkhoff. In her opening statement, Kerkhoff said the four protesters “made the choice to engage in violence and destruction,” and she promised jurors they would see video of three of the defendants destroying property. Defendants in the current trial — Michael Basillas, Seth Cadman, Anthony Felice and Casey Webber — each face eight charges: one felony county of inciting a riot, five felony counts of destruction of property, and two misdemeanor counts for conspiring to riot and engaging in a riot. Each felony carries a maximum penalty of 10 years in prison. On Inauguration Day 2017, during a day of celebration and peaceful protest, authorities said more than 200 black-clad protesters marched and ran through a portion of Northwest D.C., breaking several store windows, parking meters and bus shelters, causing an estimated $100,000 in property damage. In January, jurors found six defendants not guilty, after a trial in which prosecutors acknowledged they had no evidence the people on trial had personally caused any property damage or physical injuries. During her statement to the jury Wednesday, Kerkhoff attempted to reinforce that the current prosecution case would not be based solely on the fact that the defendants were dressed in black, wore masks and cheered while others in the group destroyed property. Prosecutors told jurors the case against Webber was slightly different, since no evidence showed him destroying property. Instead, Kerkhoff said Webber’s case was based on his alleged role in orchestrating the violence, through texts and social media posts. Opening statements for the defendants ranged from deferential to theatrical. Each defendant is represented separately. Richard Gallena, the attorney for Michael Basillas, said prosecutors would be unable to prove his client was responsible for the damage. “A small minority of protesters vandalized businesses, and they were also dressed just like Michael,” he said — all in black. Matthew Rist, representing Anthony Felice, splayed himself on the courtroom floor, demonstrating how he said police yanked his client to his feet, before yelling “get the (expletive) down,” and throwing him back to the pavement. “Spray him. Give him a good baptism of pepper spray. And that’s (the police version of) resisting arrest,” Rist said. In an attempt to head off suggestions that the prosecution was politically motivated, Kerkhoff defended peaceful protests. According to Bill Miller, spokesman with the U.S. Attorney’s Office for the District of Columbia, 234 people were initially arrested or charged. Twenty people pleaded guilty to charges in the case, before the first trial took place. After the January acquittals, prosecutors dismissed charges against 129 defendants. In addition to the defendants currently in court, 54 other defendants are due to stand trial, in groups of five or six. The trial, before D.C. Superior Court Judge Kimberley Knowles, is expected to take up to three weeks.